Softball is a variant of baseball played with a larger ball (11 to 12 in. circumference) on a field that has base lengths of 60 feet, a pitcher's mound that ranges from 35-43 feet away from home plate, and a homerun fence that is 220 feet away from home plate. It was invented in 1887 in Chicago, Illinois, United States as an indoor game. The game moves at a faster pace than traditional baseball. There is less time for the base runner to get to first while the opponent fields the ball; yet, the fielder has less time to field the ball while the opponent is running down to first base. The name softball was given to the game in 1926, because the ball used to be soft, however in modern day usage, the balls are hard. In 1895 Lewis Rober, Sr. of Minneapolis organized outdoor games as exercise for firefighters;  this game was known as kitten ball (after the first team to play it), lemon ball, or diamond ball. Rober's version of the game used a ball 12 inches (30 cm) in circumference, rather than the 16-inch (41 cm) ball used by the Farragut club, and eventually the Minneapolis ball prevailed, although the dimensions of the Minneapolis diamond were passed over in favor of the dimensions of the Chicago one. Rober may not have been familiar with the Farragut Club rules. Fire Station No. 19 in Minneapolis, Rober's post from 1896 to 1906, was listed on the National Register of Historic Places in part for its association with the sport's development. The first softball league outside the United States was organized in Toronto in 1897. Sixteen-inch softball, also sometimes referred to as "mush ball" or "super-slow pitch", is a direct descendant of Hancock's original game. Defensive players are not allowed to wear fielding gloves. Sixteen-inch softball is played extensively in Chicago,  where devotees such as the late Mike Royko consider it the "real" game,  and New Orleans. In New Orleans, sixteen-inch softball is called "Cabbage Ball" and is a popular team sport in area elementary and high schools. In 1991, women's fastpitch softball was selected to debut at the 1996 Summer Olympics. The 1996 Olympics also marked a key era in the introduction of technology in softball. The IOC funded a landmark biomechanical study on pitching during the games. Fastpitch softball is played between two teams on a large field, with nine players from one team on the field at a time. Slow-pitch softball is played with ten fielders. The field is usually composed of a dirt or brick-dust infield that contains the quadrilateral shape, and running areas, of a diamond, and a grass outfield. However, the field can consist of other solid and dry surfaces such as artificial turf or asphalt. 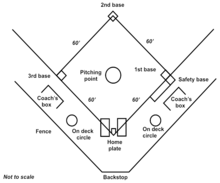 There are four bases on the infield ( first base, second base, third base, and home plate); the bases are arranged in a square and are typically 45 to 65 feet (14 to 20 m) apart. Near the center of this square is the pitcher's circle, and within the circle is the "rubber", a small flat rectangular piece of rubber about a foot and a half in length. The rubber can be 40 or 43 feet away from home plate, depending on age level and the league one is playing in. The object of the game is to score more runs (points) than the other team by batting (hitting) a ball into play and running around the bases, touching each one in succession. The ball is a sphere of light material, covered with leather or synthetic material. It is 10 to 12 inches (25–30 cm) (or, rarely, 16 in or 41 cm ) in circumference. The game is officiated by one or more neutral umpires. Players and umpires are generally free to ask for a brief stoppage at any time when the ball is not in play (called a time out), or immediately following a play once its outcome is clear. To start play, the offense sends a batter to home plate. The batting order must be fixed at the start of the game, and players may not bat out of turn. The defense's pitcher stands atop the rubber and throws (" pitches") the ball towards home plate using an underhanded motion. In slow-pitch, the pitcher must have both feet in contact with the pitching rubber at all times. In fastpitch, the pitcher is allowed to take one step back prior to releasing the ball during the forward movement. The batter attempts to hit the pitched ball with a bat, a long, round, smooth stick made of wood, metal or composite. If the pitcher throws three strikes against a batter, then the batter is out and the next batter in the order comes up to bat. A strike is recorded any time a batter swings at and misses a pitch or when a batter hits a ball foul (out of play). A strike is also recorded any time the batter does not swing at a pitch that crosses home plate within an area known as the strike zone. To be within the strike zone, the pitch must cross over home plate, and as it crosses it must be above the knees and slightly below the shoulders (roughly the armpit or the shirt logo). The strike zone therefore varies from batter to batter. A pitch outside the strike zone is a ball. If the batter reaches four balls, the batter is awarded the first base in what is known as a "walk". The umpire behind home plate is the sole arbiter of balls and strikes. A foul ball may or may not result in a strikeout dependent upon what association and local league rules. However, bunting a foul ball does result in a strikeout. In some associations and leagues, bunting is not allowed and results in an out. Also, if a player has two strikes, swinging and partially hitting the ball can result in an out if the catcher manages to catch the tipped ball. A ball hit in the air and caught before hitting the ground, in fair or foul territory, puts the batter out. A fly ball is a ball hit high and deep, a pop fly is a ball hit high but short, and a line drive is a ball hit close to the horizontal. After the catch, runners must return to their original bases; if the defense throws the ball to that base before the runner returns, the runner is out as well, resulting in a double play. A runner who remains on the base until the ball is touched, or returns to the base ( tags up) after the catch, may try to advance to the next base, at the risk of being tagged out between bases. As in baseball, the infield fly rule applies in some game situations to prevent the defense from recording multiple force outs by deliberately dropping an easy catch. In Chicago, where softball was invented, it remains traditional to play with a ball 16 inches (41 centimeters) in circumference. The fielders do not wear gloves or mitts. A 16" softball when new is rough and hard, with hand and finger injuries to fielders frequent if they do not "give" when receiving a ball,  but the ball "breaks in" slightly during a game and continues to soften over time with continued play. A well-broken-in ball is called a mush ball and is favoured for informal "pick-up" games and when playing in limited space, such as a city street (because the ball does not go as far). A 16-inch ball is also used for wheelchair softball. The bat used by the batter can be made of wood, aluminum, or composite materials such as carbon fiber. Sizes may vary but they may be no more than 34 inches (86 cm) long, 2.4 inches (6 cm) in diameter, or 38 ounces (1.1 kg) in mass. The standard bat barrel diameter for both slowpitch and fastpitch softball is 2​1⁄4 inches. Many players prefer a smaller barrel, which reduces mass and allows higher swing speed. Although there are a variety of bats used, there are several that are banned due to performance enhancement. These bats are determined to be illegal by the Amateur Softball Association of America. Several bats are banned because of the harm it may place upon other teams and/or giving them an unfair advantage. For example, with a thinner wall, players are able to swing the bat faster, which allows the ball to go faster, harder, and further. Major League Softball, played at Recreational Parks, include a variety of teams; Men's, Women's, Co-Ed. Each League has its own specific regulations with bats, but most must be approved by the Amateur Softball Association. Many bats may be "doctored" or "juiced" in a sense that they are end loaded, shaved and or painted. End loading of a cap refers to the addition of weight manually placed at the end of the barrel to distribute more weight at the tip. Shaving bats require machine use in order to remove the inner walls of the bat to improve elasticity. Lastly, painting bats is done because competitors purchase "illegal" bats that are dangerous and hazardous to the opposing team. These three "doctored" and "juiced" techniques are banned from Leagues, but are still done today. A softball game can last anywhere from 3 to 7 innings, or 1–2 hours depending on the league, rules, and type of softball; however 7 innings is the most common. In each inning, each team bats until three batters have been put out (see below). The teams take turns batting. Officially, which team bats first is decided by a coin toss,  although a league may decide otherwise at its discretion. The most common rule is that the home team bats second. Batting second is also called "last at-bat". Many softball players prefer to bat second because they feel they have more control in the last inning, since they have the last at-bat. In games where one team leads by a large margin, the run ahead rule may come into play in order to avoid embarrassing weaker teams. In fastpitch and modified pitch, a margin of 15 runs after three innings, 10 after four, or 7 after five is sufficient for a win to be declared for the leading team. In slow pitch, the margin is 20 runs after four innings or 15 after five innings. In the NCAA, the required margin after 5 innings is 8 runs. The mercy rule takes effect at the end of an inning. Thus, if the team batting first is ahead by enough runs for the rule to come into effect, the team batting second is given their half of the inning to try to narrow the margin. The pitcher is the individual who throws the ball from the middle of the diamond. As in baseball, fastpitch softball has a rubber used to control the pitchers delivery. A pitcher must have both feet on the rubber at the start of their delivery but neither foot is on the rubber when the ball is released. In baseball, the rubber is on a mound of dirt as gravity is used to generate speed. In softball, the pitchers throw from within a circle and the rubber in the circle is not elevated. The circle is also used to control base runners. When the pitcher is in possession of the ball in the circle, a runner who has passed a base must either advance or return to the base. They cannot "bait" the pitcher to throw or they will be called out. The pitcher tries to throw the ball in the strike zone. In order to do that, they start while having the ball in their glove, they throw their arms behind their hips, they shoot forwards with their leg, which is on the same side as their glove, and leave their glove hand there and the other arm goes around the shoulder, bends the elbow, and turns their wrist toward the 3rd baseman, and brings their arm through at the end, flicks their wrist, and brings the arm up, with the hand by their shoulder. They follow through with their legs turning their pitching stance into a fielding stance. They try to release the ball when they go past their hips. In softball, the pitcher uses an underarm motion to pitch the ball towards the strike zone. As soon as the pitcher makes a throw, the fielders are ready to field balls that are hit in the middle of the diamond. Pitchers usually tend to be tall, very flexible and have good upper body strength. Pitchers can be righthanded or lefthanded. The softball pitcher makes a windmill motion while throwing underhand, unlike baseball pitchers who throw overhand. The shortstop fields all balls hit to the infield between the second and third bases. This individual also helps cover second and third bases, is frequently involved in force plays and double plays, and often throws the ball to the catcher to throw out runners at home plate. On steals to second base (when the runner from first is advancing to second on the pitch) the shortstop usually covers. The shortstop doesn't cover second base only when a right handed batter is up. In this case, the second baseman covers the steal. Most short stops are very quick, agile and think fast. Shortstops may play in a restricted zone but are faced with many types of hits and interact closely with the 2nd base, 3rd base and home plate. Often double plays are due to quick thinking/reaction by the short stop. When a ball is hit up the middle and the shortstop catches it, they will flip the ball to the second baseman for the best result. Shortstop also takes the cut off for the left field when the play is at second base. When the ball is hit to the right side of the outfield, the short stop then covers second base. If there is a runner on first base and there is a hit down the line or in the gap to right field, the shortstop will then go for the cut to third. Meaning the runner that is going from first to second will most likely be advancing to third, and in that case, the shortstop will be the cut off for the throw from right field to third base. Shortstop can be one of the most difficult positions to play due to the number of balls being hit in that direction. In the recent years, the NCAA rules  changed when concerning the batters feet while in the box. The rule now states that as long as any part of the batter's foot is in the box the ball will stay live. It is not until the batter's entire foot is out of the box, that the play will be declared dead and the batter called out. The SEC (college ball), however, claims that if any part of the batter's foot is out of the box when she makes contact, she is out and the play is dead. Japan has had a long tradition of softball which is played at all levels in the country. Many high schools and colleges have sports programs which include softball. Like baseball, softball in Japan is intensely competitive. Japan's win over the United States at the 2008 Olympics  reflects the advanced level of play in this East Asian country. China is fast becoming the team to watch in softball. Since the silver medal in the Atlanta Olympics 14 years ago, the Chinese have now made softball a priority at all levels. The game is played in most schools and with a 1.3 billion population; the number of great players is turning out to be a boon for China. The Chinese have frequently toured the US and have now similar caliber coaching and training programs. It is estimated that 14.62 million Americans played at least one game of softball during the spring of 2015. It is played by men and women both recreationally and competitively.